The World Federation of Public Health Associations would like to congratulate our President Michael Moore on his newly received honour. On Australia Day, 26th of January 2017, Prof. Michael Moore became a Member of the Order of Australia (AM) in recognition of his significant service to community health, particularly to social policy reform, and to the community of the Australian Capital Territory. The Order of Australia is an order of chivalry, established to recognise Australian citizens and other persons for achievement or meritorious service. Prof. Moore said “these things are always also a recognition of those around who offer their support, encouragement and ideas. I have been fortunate for many decades to be surrounded by people working for a better world and fairer, healthier communities. It is part of the joy of working in public health”. The World Federation of Public Health Associations would like to congratulate Slovenia and the Slovenian Government on their adoption of Tobacco Control Law. With a unanimous vote of 61 for, and 0 against the adoption of the law, all parties and members voted to adopt tobacco control measures, which will include plain packaging, advertisement bans on tobacco products, and increasing and earmarking excise tax. Despite previously expressed reservations or opposition from a number of parties and members, all ultimately voted in support of the law, which will come into force with multi-party support from 2020. This is a terrific outcome for our colleagues in Slovenia and in WHO Europe who have done much to support the progression of the law and its adoption. The 15th World Congress on Public Health will begin on the 3rd of April 2017 in beautiful Melbourne, Australia. We look forward to seeing you there for a fun and informative week filled with distinguished speakers from around the world. Are you one of the 2000+ delegates who have already registered to join us in Melbourne? If not, there is still time! Registrations close on the 31st of March 2017. Click here to register now and join us in Melbourne. The full program with topics, speakers and room allocations is now available! Start planning your time at the Congress to ensure you get the most out of the week. There is also an exciting social and ceremonial program which has been planned for the Congress. A Welcome Reception, Opening Ceremony and Congress Party will take place on Sunday 2nd, Monday 3rd and Tuesday 4th of April, respectively, and all of which are included when you register as a full delegate or student for the 15th WCPH. For futher information regarding the 15th WCPH, Congress accommodation or travelling to Australia please see our Events tab. The WFPHA General Assembly, committees and working groups will meet during the 15th WCPH. For the detailed schedule of meetings, please refer to the members communication section below. As this is the last newsletter before the Congress and General Assembly, if any changes are made to the meetings schedule, these will be updated on and communicated via the 15th WCPH tab of our website. Please note, attendance to the WFPHA General Assembly is by invite only. SUPPORT THE ADVOCACY WORK OF THE WFPHA AND BUY RAFFLE TICKETS FROM US DURING THE CONGRESS! We will be selling raffle tickets for AUD$5 each, or 5 for AUD$20 at the WFPHA booths G39 and G40 in the exhibition area of the Congress and during the WFPHA General Assembly. By buying a raffle ticket, not only do you invest in a better future for Global Health, but you also go in the draw to win a beautiful Aboriginal Painting (retail value AUD$3000) as first prize, FitBit Charge 2 as second prize or Kindle for thrid prize. Additionally, ALL winners will be awarded with the prestigous title of "Diplomat of the Global Charter". The raffle will be draw during the WFPHA Award Ceremony on Thursday 6th of April, from 17:00. So come say hello to us at the booth, buy some raffle tickets, and don't miss out on your opportunity to support the work of the WFPHA and win some incredible prizes! The World Federation of Public Health Associations will be celebrating it's 50th Anniversary during the 15th World Congress on Public Health in Melbourne, Australia. During World Health Day, on Friday the 7th of April, WFPHA will celebrate its anniversary between 9:45am-10:45am in Plenary Room 1. Please join us and help the WFPHA celebrate this momentous milestone! The WFPHA Photo Competition was a Huge Success! As a part of the 50th anniversary of the World Federation of Public Health Association, a photo competition was held. 145 photographs were submitted from over 30 different countries, identifying various achievements and challenges in public health. Some of the submitted entries were displayed on the WFPHA social media, including its new Instagram. In addition, several were showcased on the front cover of the WFPHA 2016 Annual Report. The best three photos will be selected by a committee of 20 individuals, with the winners being announced during the 15th World Congress on Public Health. A video of all the entries has also been created and will be displayed during the 15th World Congress in Melbourne as well as available shortly on YouTube. The 4th International Student Meet on Public Health 2017 (ISMOPH17) will be held in conjunction with the 15th World Congress on Public Health (WCPH) in Australia, at Melbourne University’s Melbourne School of Design on the April 1st 2017. ISMOPH17 is a one-day student-run and student-oriented conference presenting many networking, upskilling and academic opportunities. You are warmly invited to join a diverse range of like-minded students from all over the world to take part in the conversation, collaboration and celebration of important and relevant issues in the field of public health. This is a great opportunity to experience the 15th WCPH and at AUD$22 per person, experience it at a fraction of the cost. Registrations opened on January 16th 2017. With a limited number of spaces available, register now to ensure you don’t miss out on this incredible opportunity! Click here, to register for the 4th International Student Meet on Public Health 2017. Follow ISMOPH17 on facebook and keep up-to-date with information on the conference. Click here, for the facebook page. Michael Moore is the CEO of the Public Health Association of Australia and is the President of the World Federation of Public Health Associations. He is a former Minister of Health and Community Care and current adjunct professor with the University of Canberra where he is a PhD Scholar examining a framework for planning or evaluating health advocacy. Michael recently became a Member of the Order of Australia in recognition of his significant service to community health, particularly to social policy reform, and to the community of the Australian Capital Territory. Carl Abelardo Antonio is a tenured Assistant Professor in public health at the University of the Philippines Manila, and concurrent Assistant Dean for Academic Affairs in the College of Public Health. He actively leads research and consultancy projects for government agencies, industry, and civil society organizations focused on various aspects of local health systems strengthening. Carl is also a contributor to several local and international scientific committees, working groups, and journals. Prior to joining the faculty, he worked for four years as a community physician for the health department of the Pasay City Government in the Philippine’s capital region. The WFPHA is currently in the process of selecting new Diplomats of the Global Charter for 2017. Individuals wishing to spread the Charter within their country and network, and sustain this global public health revolution within their working and living context are invited to apply. Each Diplomat will be listed on the WFPHA website, a 100-word bionote will be published on the Facebook page, the selected individuals will be able to use the title 'Diplomat of the Global Charter' after his/her signature for the year selected, and they will receive a 5% reduction on the entrance fees for the World Congress on Public Health for year after. The meeting, organised by the WHO European office, aimed to accelerate progress towards the implementation of the European Action Plan for Strengthening Public Health Capacities and Services by bringing together international public health community experts to discuss the formation of a coalition of partners to initiate the creation of a joint agenda for action. The World Federation of Public Health Associations, as repres ented by Prof Bettina Borisch and Dr Marta Lomazzi, actively participated in the meeting and presented the Global Charter for the Public’s Health to colleagues during a dedicated breakfast meeting on the second day of the workshop. During the meeting, Prof Borisch and Dr Lomazzi discussed the operationalisation of the Global Charter and how to set-up collaborations to help develop this project. The Coalition of Partners developed a visual recording of their meeting and the agenda for action which addresses, 'which actions do we want to undertake together to support one another in strengthening public health services?'. To view this visual recording in detail, click here. December 15th, the Brazilian Senate voted a proposal of an amendment to the constitution (PEC55) that foresees a linear restriction to all public expenses until 2036. The public expenses will follow the annual inflation rate. This holds true for all sectors of the state budget. The health and educational systems are fundamentals of our societies; that is why in Brazil the Sistema Unico de Saude (SUS) has been introduced in 1988 into the constitution. The SUS is meant to provide a Universal Health Coverage (UHC), an United Nations Sustainable Development Goal agreed upon by all UN member states, for all Brazilian citizens. On the 14 th and 15th of December, 2016, Prof Bettina Borisch and Dr Marta Lomazzi, representing the World Federation of Public Health Associations (WFPHA), attended a two-day High-Level Ministerial Meeting in Geneva with Governments, professional associations, civil society and the private sector to discuss and commit to action the recommendations of the High-Level Commission on Health Employment and Economic Growth. New Zealand has one of the most effective and efficient health systems in the world, and yet we rate poorly on equity and access for the most vulnerable members of our society. The Ministry of Health recognizes that while three out of five New Zealanders rate their health as very good or excellent, people who rate their health as poor are more likely to be older, unemployed, struggling on a low income, have low educational qualifications and be of Maori or Pacifica ethnicity. The focus of the Public Health Association of New Zealand continues to be on child poverty, housing, oral health, mental health, and the underlying causes of non-communicable disease such as tobacco, nutrition and physical activity. In 2016 we continued to challenge our Government to adopt an ambitious target to reduce carbon emissions and promote awareness of the impact of climate change on our close Pacific neighbours. We also continued to oppose the Trans-Pacific partnership as potentially preventing our Government from regulating industries such as alcohol, tobacco and food that damage the health of our people. The health of Maori, NZ’s indigenous people, remains a priority, and the PHA’s Maori caucus celebrated its 20th anniversary, delivered another influential Maori public health symposium, and a symposium on institutional racism. We are also very proud to have achieved the election of one of our Vice-President, Adrian Te Patu, as the Asia-Pacific representative to the WFPHA governing council (photo on right). We have been working with our Australian colleagues planning the WFPHA’s 50th anniversary Congress in Melbourne in April 2017, and planning together with our colleagues in the NZ College of Public Health Medicine and the Health Promotion Forum, for our next Population Health Congress in 2018, and the IUHPE Congress in 2019. The Indonesian Public Health Association (IPHA), as a professional Organisation, has been engaging in the health sector by giving direction on health development, and assisting, critiquing and arranging the development of national public health policy programs. Throughout 2016, we actively participated in activities to support the health of the nation through education, advocacy, community development and brokering knowledge. The IPHA collaborated with the Indonesian Public Health Education Institutional Network (INDOPHEIN) to assist with the competency examinations undertaken by graduates from the Public Health Institute of Indonesia. These exams aim to standardise the competency of students graduating from the Institute to ensure a national standard is met. We have continued our collaboration with the SC Johnson campaign against Dengue Fever as part of our community development work through Jakarta and other cities in Indonesia. This program’s goal is to help the Indonesian Government and empower society to combat Dengue Fever through preventative methods. The IPHA held the 2nd Annual Science Forum (FIT) as a knowledge brokering activity. During FIT, many sessions such as panels and parallel sessions, trainings and the Organizational meeting (13th IPHA National Meeting) to choose the president elect for the next period, were held. with registrations now open. The PHASA invites the South African public health community and international colleagues to join them for the conference which will be centred around the 'Global Charter for the Public's Health' and will discuss the implications for Public Health Practice in South Africa. The 2017 General Assembly of the WFPHA will take place in Melbourne, Australia, during the 15th World Congress on Public Health. The General Assembly is for WFPHA Members and upon invitation only. Regional and working group meetings will also take place during the Congress. Regional meetings are open to national public health associations of the corresponding region. Working group meetings are open to anyone who may be interested in the meeting topic and in joining the group. Information on the schedule for regional and working group meetings will be communicated shortly via our website. Please check our Congress tab in the coming weeks for the times and location of these meetings. Information on the schedule of the General Assembly meetings can be found below. Award Ceremony - Winners of the WFPHA photo competition and raffle, and organisational and lifetime achievement awards will be awarded. Ms. Annelysse Jorgenson joined the WFPHA International Office as an intern early January 2017, and is undertaking a three month internship with the Federation. She has a Bachelor of Science with majors in Neuroscience, and Anatomy and Histology, and a Master of International Public Health from the University of Sydney, Australia. Throughout 2016, Annelysse worked for a Clinical Research Organisation, and as a tutor for the Masters level subject, Global Communicable Disease Control, at the University of Sydney. Annelysse joined the WFPHA with the goal of developing a deeper understanding of the structure and workings of a NGO, and for the opportunity to positively contribute to global public health in an international and multi-cultural organisation. With a passion for international public health, she hopes to pursue a career in grass-root projects and research with specific interests in communicable diseases and disease control, anti-microbial resistance, sexual and reproductive health, and neurodegenerative diseases. Ms. Beza Girma Tekleyohanes is a fifth-year medical student at Addis Ababa University’s School of Medicine in Addis Ababa, Ethiopia. She began her internship with the WFPHA mid-January and will spend one month with the Federation in the International Office, continuing her internship for a further two months from Ethiopia at the African Federation of Public Health Associations Office. Beza Girma gained an interest in public health when she began participating in the International Federation of Medical Students Association’s (IFMSA) standing committee of public health three years ago. Since then, her love and interest in public health has grown even more. Beza Girma believes awareness of public health is important to medical students as they are often more concerned with curing rather than preventing diseases. She applied to intern with the WFPHA as her dream is to see public health in a much more diverse way, and hopes for a world where everyone works together to be the difference we want to see globally. During the 15th World Congress on Public Health in April 2017, several of the WFPHA Regional and Working Group Chairs will take the stage to lead and discuss different topics within the World Leadership Dialogues (WLD). On Monday 3rd of April, Prof Laetitia Rispel, from the Global Health Equity Working Group, will speak on “Politics, policies and processes: advancing complex policy agendas - the case of the WHO Commission on Social Determinants of Health”, followed by Prof Judy Lewis, of the Women, Children and Adolescents Working Group, who will lead the discussion on “The Global Strategy for Women, Children and Adolescents and the Sustainable Development Goals: Working together to improve health and equity “ during the afternoon WLD. Prof Martin McKee, of the European regional group, will speak on “Trade and investment treaties and public health policy space” during the evening WLD session. Tuesday 4th of April will see the WFPHA Environmental Health working group coming together to lead and discuss "Integrating ecological determinants into Public Health Practice" during the afternoon session of the WLD. On Wednesday 5th of April, Prof Mike Daube will lead the discussion with the Tobacco Control Working Group on “Tobacco Control”, to be followed by Prof Laetitia Rispel and Prof Martin McKee, who will discuss “Global Health Governance, WHO and the vision of Health for All” during the afternoon WLD session. Prof Raman Bedi will be joined by the WFPHA Oral Health Working Group in the evening WLD session to lead and discuss “Universal dental care provision - will it really improve oral health?”. Finally, on Thursday 6th of April, Dr Thomas Piggott and the Student and Young Professionals Section will discuss "Young Professionals and the Future of Public Health" during the afternoon WLD. For specific times and locations of each speaker, please see the Congress program. Looking towards 2030, the Agenda for Sustainable Development and the Sustainable Development Goals (SDGs) are encouraging world leaders to enable transformative change and address the complex health, social economic and political challenges countries are facing. On January 12th 2017, guest speakers from the Chinese Academy of Social Sciences (CASS) joined with members of the United Nations Research Institute for Social Development (UNRISD) and International Telecommunication Union (ITU) as panellists to discuss key policy, technological and institutional innovations that will be valuable in realising the 2030 Agenda. From the UNRISD 2016 Flagship Report, three key messages for stimulating transformative change towards sustainable development were discussed in the seminar. Firstly, combatting challenges such as poverty and inequality require transformative changes which address the root cause of the problem and not just the surface manifestation of the problem. Secondly, innovative policies which overcome vertical or “silo” approaches and promote eco-social development thinking and practise will be the largest drivers of transformative change, and thirdly, innovations are transformative when they are based in universal rights policy, promote policy integration, positively change markets for contextual adaptation, and lead to empowered and accountable institutions. Within policy, six areas where innovation and reform would have greatest transformative potential and impact on realising the 2030 Agenda were highlighted. Innovations to social, care, climate change, domestic resource mobilisation, social and solidarity economy, and governance policy are important players to reconfigure the economic, social and political landscape both globally and within countries. 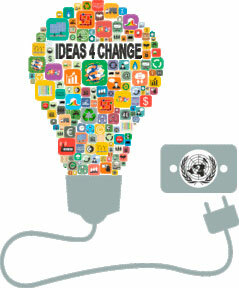 Innovation in these areas of policy, in coherence and integration with each other, will result in greater equality with the empowerment of disadvantaged and vulnerable groups, encouragement of active citizenship, change in global power relations, and reversal of economic objectives and values to those of social and environmental goals. The role of technology in sustainable development was discussed closely with SDGs 4, 5 and 9. To assist quality education (SDG 4), technological infrastructure is required to provide students, teachers and families with computers, mobile phones and other technologies through which they are able to access mobile networks and internet for communication and information. Gender equality (SDG 5) was highlighted in a similar light, however emphasised how increased accessibility to technologies will help girls and women have equal access to and opportunities in technology, communications and information. Progress in industry, innovation and infrastructure (SDG 9) is imperative to achieve goals 4 and 5 as industry and infrastructure will act as a foundation for quality education and gender equality, and innovation will drive transformative change. Panellists from CASS discussed innovation and sustainable development with the specific examples of some Chinese social policies and industrialisation processes. Innovative social policy must be inclusive of development and considers the interaction between social, political and economic facets. Social policies emphasised during the seminar were labour migration, poverty alleviation, universal education and social security within the context of China. The “ATPE” system of targeted innovation in these areas has been adopted by the Chinese Government to assist the development of policies and encourage transformative change. The “ATPE” approach consists of accurate identification, targeted support, precise management and elaborate assessment, and is applied as a framework for social policy change in the different sectors. It was noted during the seminar that while industrialisation is positive for a country’s economy, industrialisation also poses a threat to sustainable development without the correct innovations to policy and transformative change. Risks such as pollution, overcapacity, industrial innovation weakness and unsustainable comparative advantage come with industrial growth and demonstrate the necessity for countries to introduce innovative and cohesive policy to mitigate these risks and increase sustainability. Innovations’ role in sustainable development lies in its potential to drive transformative change in all sectors to which it is applied. Innovation to address the root cause of problems, encourage integrative approaches and stimulate transformative change is essential in sustainable development. Through the introduction of innovative policy, technology, and institutions, sustainable development will be supported by a strong foundation which is able to adapt to future global growth and help achieve the 2030 Agenda. The report, Advancing the Right to Health: The Vital Role of Law, is a collaboration between the World Health Organisation, the International Development Law Organisation, the O’Neill Institute for National and Global Health Law at Georgetown University, and Sydney Law School at the University of Sydney. Published in January 2017, the report addresses the significant impact effective laws and an enabling legal environment have in protecting public health and provides guidance on how to use legislation to compliment public health interventions. The report gives examples of some of the most successful public health interventions driven and subsequently supported by law which include tobacco control in Australia, compulsory helmet wearing on motorbikes in Vietnam, Mexico’s “Soda Tax” and mandatory reporting of specific infectious diseases globally. These, along with countless other legal interventions globally, have contributed to significant decreases in the morbidity and mortality from the public health challenge they target. Utilising law to protect public health ensures a strong and enduring foundation for positive change at a societal, national and global level. Changing the informational environment to improve the general public’s health literacy, changing the built environment to make health the easier choice, direct regulation e.g quarantine measures, indirect regulation e.g tort action, and changing the economic environment to support healthy choices are the five tools of law noted by the report through which public health can be influenced. When used in conjunction with each other, these five tools create a legal environment which fosters healthy living and comprehensively addresses a public health challenge. From another perspective, the role of those who enforce the law for the protection of public health is also highlighted in the report. It can be said Police Officers and those in the Forces play a role as public health officers and advocates, as they ensure citizens abide by the laws which have been implemented to increase public safety or by physically delivering the public health services nationally and/or globally. Those in positions of legislative power, such as Judges, should also be considered as protectors of public health and health rights as they should guarantee those who have not done wrong are not punished. For example, that those seeking access to HIV testing and medicine in hostile social environments are not wrongfully condemned and punished. Civil engagement through these avenues should be considered when reforming or implementing public health legislation and can be used as another tool for public health. At both the national and international level, the utilisation of law is a powerful tool for addressing public health challenges and can influence both the health of groups and individuals. Recognising the vital role of law in health is imperative to producing comprehensive approaches which have a strong legislative basis to assist in the actioning, monitoring and evaluation of the intervention. The report, Advancing the Right to Health: The Vital Role of Law, can be found online in full. Click here to access the report for free. The Lancet Planetary Health, a gold open access journal in the Lancet family is now available for viewing and submissions. The journal is dedicated to the health of the human civilisation and the state of the natural systems on which it depends. Building on the foundation of The Rockefeller Foundation–Lancet Commission on planetary health, each monthly issue of this online journal will feature high quality original research, editorials, and provocative comment and opinion with the aim of defining and advancing planetary health worldwide. All original research which has the potential to change or challenge the interplay between the environment and human health are invited for submission. In keeping with other Lancet journals, The Lancet Planetary Health will offer rapid publication of research online within 8-12 weeks from submission. To read more about the new journal or to submit a manuscript for publishing, please click here. If you have any questions relating to the submission of articles, please click here. The 140th World Health Organisation Executive Board Meeting was held on the 23rd January - 1st February 2017. The meeting agreed on the agenda for the May 2017 World Health Assembly and adopted resolutions to be forwarded to the Assembly. Board Members discussed priority issues in the areas of communicable and noncommunicable diseases; promoting health through the life course; preparedness, surveillance and response; and health systems as well as matters relating to programme, budget, management and governance, and WHO reform. This year, with the election process for the next Director-General having commenced, five candidates for the role were interviewed and voted on. On the 25th of January, three candidates were announced as nominees to be presented for final vote during the World Health Assembly, May 2017. The three candidates for the role of Director-General, as voted by the Member States, are Dr Tedros Adhanom Ghebreyesus, Dr David Nabarro and Dr Sania Nishtar. The new Director-General will take office on July 1st, 2017. 8.1 Human resources for health and implementation of the outcomes of the United Nations’ High-Level Commission on Health Employment and Economic Growth. Executive Board Members and Member States called for ambitious and concrete actions to be implemented in response to the five-year action plan for health employment and economic growth. Board Members and Member States agreed the ten recommendations presented in the High-Level Commission will assist the WHO Global Strategy on Human Resources for Health to be implemented, and encourages the promotion of the global health workforce and cross-sectoral agreements. The United States of America however, expressed concerns over the potential of the Global Strategy on Human Resources for Health overshadowing the High-Level Commission, rather than working in coherence with the report. Norway stated the five-year action plan requires clearer direction as to whether it is a tool for the three organisations, WHO, ILO and OEDC, or the Member States for implementation. Board Members and Member States acknowledged the challenges in public health and health workforce cannot be solved by action within the health sector alone, but rather replies on multi-stakeholder, national workforce strategies. Adoption of the report was deferred, as amendments suggested by Board Members would require more extensive discussion outside of the Executive Board Meeting. 8.4: Evaluation and review of the global strategy and plan of action on public health, innovation and intellectual property. All Executive Board members and Member States agreed the report was comprehensive and provided good guidance on public health, innovation and intellectual property. There was a general consensus the topic of intellectual property was a complicated matter which required inter-sectoral, national and international coordination, and the proposed action plan put forward could be seen as adaptable for the health, political and social climates globally. Minor amendments to the terminology were suggested by a number of EB members and Member States however no major amendments to the report were proposed. It was highlighted the report lacked information and focus on the monitoring and reporting systems for public policy development and implementation surrounding intellectual property however global challenges for public health, innovation and intellectual property were well defined through the classifications of the countries into the 4 World Bank country groups. The importance of North-South, South-South collaboration in intellectual property and policy for medicine access in LMIC’s was stated a number of times throughout country statements. The report was noted by the Executive Board. Funding short falls was a big focus of country statements. Many noted that the funding shortfall was despite large scale efforts and very successful fundraising so more needs to be done to boost project funding etc. The proposal in the report for a committee for the “Voluntary Pooled Fund” to finance research and development was strongly supported by EB members and Member States. The suggestion of an expert committee to provide advice and guidance on what areas are important for research and development was well received by other countries. Detection and evaluation of gaps for prioritisation of research and development topics was highlighted as an important area of focus. Research into antimicrobial resistance and epidemic diseases was also strongly supported by EB members and Member States. The “Global Observatory on Health R&D” was noted to have been launched and available as a research and development resource. The importance of close coordination and collaboration between the WHO, WIPO and WTO was stated by a number of countries. A plea for the recognition and support of research and development initiatives outside of the WHO, and in particular funding of the African organisation run by African workers, ANDD, which will soon be closed if funding does not come in. The report was noted by the Executive Board. The report was strongly supported and gives good guidance and suggestions on vaccine schedules, vaccine research and development, Polio elimination and Measles eradication. Expanding immunisation services from infants and children to the whole life course was strongly supported by EB members and Member States. Challenges in vaccine stocking and transparency in pricing was highlighted. Some errors in data used for the report and reported in the report were highlighted to be incorrect e.g the report states there is no transmission of Measles in the Russian Federation, when this is not correct and there has been transmission in the past few years. Recommendations of stable funding, vaccine coverage for all groups including migrants, and improving the quality of data on immunisations proposed in the report were strongly supported. A framework for supply chain and logistics management is sought from the WHO for benefiting geographically disadvantaged areas. Concerns over the slow progress towards achievement of goals in the Global Vaccine Action Plan (2011-2020) was highlighted in statements. Greater mobilisation and coordination to address gaps in technical and finance sectors in LMIC is required to assist with getting GVAP back on track. The on-going challenge of sustainability of vaccination programs was noted and point of focus in statements. The report was noted by the Executive Board. The Executive Board members, Member states and NGO`s were satisfied with the report from the DG. They emphasised the importance of instruments of change needed to strengthen health systems for universal health coverage, and facilitation factors for sustaining equity and respect for human rights. Technology transfer, key health strategies and availability of human and financial resources in the Africa region and country offices was also highlighted as important for positive change. The statement from Canada emphasised gender equality, and sexual and reproductive rights as important goals in the sustainable development agenda. The need for multi-sectoral collaboration at the global and country level for policy implementation and alignment with the program budget was raised by a number of countries. The role of active youth participation in policymaking process was highlighted, and a call for the WHO to encourage countries to organise their road maps was made. Most agreed that priority needs to be given to target implemented, evidence based interventions and there should be more focus on health system, health strategy, financing, HR, leadership and coordination. This article discusses the main features of the health equity strategy, and possible obstacles to a successful implementation and a prolonged commitment to reducing health inequalities in Norway. This article presents the findings from research which sought to quantify the role of extensively drug-resistant tuberculosis transmission and to elucidate how and where transmission is occurring in South Africa. This article presents the findings from research which investigated current exposures to specific risk factors in the home of New Zealanders during the first five years of life and provided updated evidence on the links between the home environment and childhood acute respiratory infection hospitalisation. This editorial article comments on the new report, Advancing the Right to Health: The Vital Role of Law, and how law has not yet gained sufficient attention in global health discussions.